Last night when I got home from another delightful (and yes, triumphant once again!) Seattle Independent Bookstore Day challenge I put this lovely mini-poster on my fridge where it belongs, with the photos of my other friends and family. 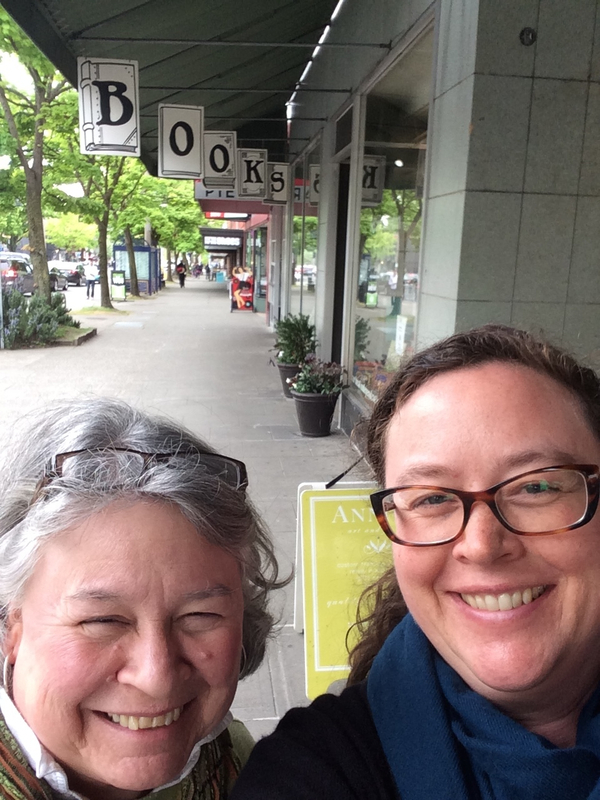 As usual—I can say as usual now that it’s been three years running—my mom (Marianne Bull) and I met on Bainbridge Island at Eagle Harbor Books at 8:30am for what is our mutually favorite most-looked-forward-to annual mother-daughter tradition. She drove up from Steilacoom on the peninsula side and I walked on the 7:55am ferry from Seattle. While on the ferry from Seattle, a woman recognized me from last year’s blog post, which was linked to in the Seattle Times write-up of Independent Bookstore Day earlier this week. That was a kick! She was doing the challenge with her whole family and they asked if they could take a picture with me since my post had inspired them to do the Bookstore Day challenge for the first time. Which made my day! before my day even got started. 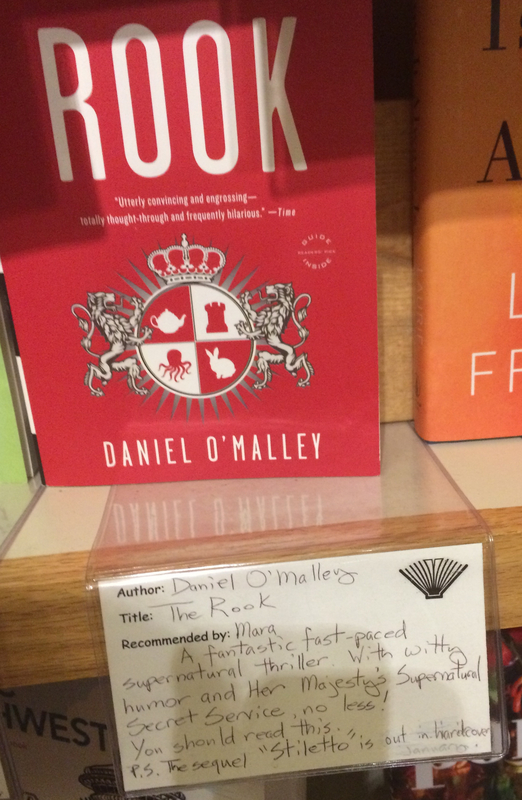 I’m so happy to have inspired someone to get out there and support independent bookstores. She asked if I worked for one of the bookstores or something and I was like nope, just a regular person. Who gets really excited about books, and talking to booksellers who are not algorithms. My first two purchases from Eagle Harbor and The Traveler. I was in a wanderlust mood apparently! Also, I know the name Nellie Bly but barely know anything about her really and this seemed like a good way to rectify that. First of many Staff Recommends purchases. We also had festive snacks. I was vastly entertained by the silverware my mom brought for the snackage. This fork has been rattling around her silverware drawer for like 45 years. She forgot to bring her own raincoat (the woman who still calls me to tell me to bring one!!! ), but remembered silverware. The project management skills of my friend Le’a, who helped me with our bookstore routes in years past, have rubbed off on me so I had two spreadsheets just in case—one if we made the 10:25am ferry to Edmonds and one if we had to wait for the 11:15. So either way we had a reasonably logical route planned out and could get to all the stores before they closed. And—and this makes it a much nicer day’s expedition—we knew for sure if we were on time, behind, or ahead of time. It wound up being kind of fun to change things up and do a pretty different order this year than the last two. We used our iphone map apps of course and learned some new ways around the city while discussing what sort of physical layout and atmosphere and je ne sais quois makes our favorite bookstores our favorites. And we were, as always, thoroughly entertained by Siri’s pronunciation of Aloha Street as “Alloh-HA”. Picked up one of the Indie Bookstore Day exclusives I really wanted at Edmonds Bookshop – got their last one! Although I had two spreadsheets, I had neglected to get around to writing up a wishlist of books, so I relied on Staff Recommends shelves and serendipitous browsing and that worked out beautifully as it always does. At Queen Anne Books I chose this one, which sounds like a great diversion from the real world. I adored the Staff Recommends I got here last year, Miss Buncle’s Book. Also at Queen Anne my mom found a beautiful new edition of Olga da Polga, which I read approximately a million times when I was a kid. It’s by the same author who did Paddington Bear but is SO much more wonderful although inexplicably less popular. This new edition has fantastic illustrations that capture guinea pig-ness flawlessly. While we were in line we ran into bookseller Tegan and we all gushed over this book together. She also told us something we didn’t know, which is that Michael Bond also wrote mysteries for adults featuring a character named Monsieur Pamplemousse. Outside Secret Garden Books, where my mom got some classics for my nephew. At Open Books my mom got a copy of WA129 state poetry anthology, which features a poem of mine, but I completely neglected to get a photo of her beaming proudly with it because we immediately shifted gears to get across the street for LUNCH. At Seattle Mystery we looked for the Michael Bond books but they were out, however the fine folks there recommended this book as one that might hit the same sort of spot. At BookTree Kirkland, one of the new bookstores on the route this year, we got books about books. The mid-century book cover design for me and the essays for mom. At the Neverending Bookshop in Bothell, another of the new bookstores, I had another lovely encounter with the booksellers, who said, “I know who you are!” again recognizing us from last year’s blog post, and we had a lively conversation about bookstores and the loving of them. 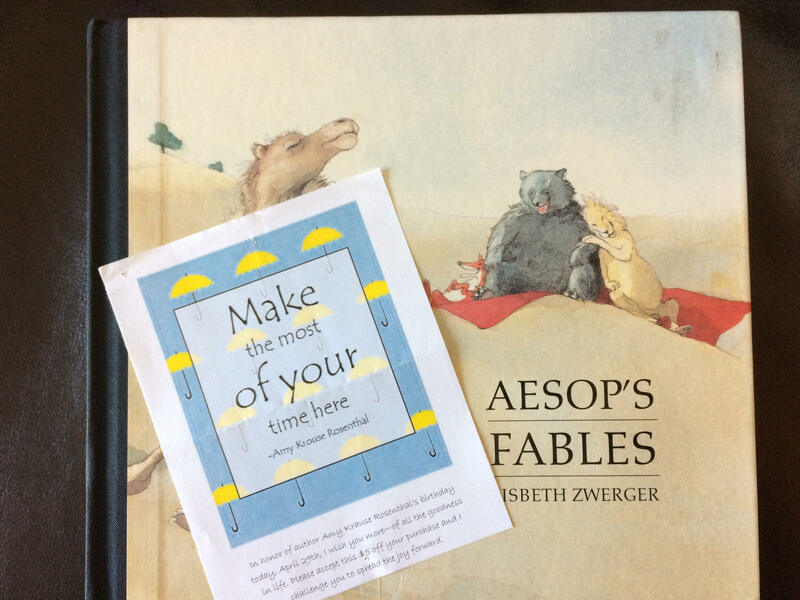 And then I discovered that someone had done this beautiful $5 “pay it forward” in honor of the late author Amy Krouse Rosenthal, which I think is just wonderful. And after that it was Island Books (where they had live music), Fantagraphics, Phinney Books (where my willpower was at its lowest and their Recommended Books at its greatest which is a fabulous combination for everything but the wallet), then Third Place Books Ravenna (where we ran into the Seattle Arts and Lectures crew and also took a timeout for some Greek food to bolster us for the last push to Ada’s and Elliott Bay). What a wonderful tradition Seattle’s independent bookstores have created, I’m not sure how many more ways I can say that. I’ll update this when I hear how many people made it to all 19 stores yesterday but I ran into a bookseller who was putting out a guess of over 300 and it wouldn’t surprise me. Here’s my 2017 Bookstore Day haul. Great-looking books from a great time hanging out with my mom and interacting all day long into other people who love books/stores as much as we do. 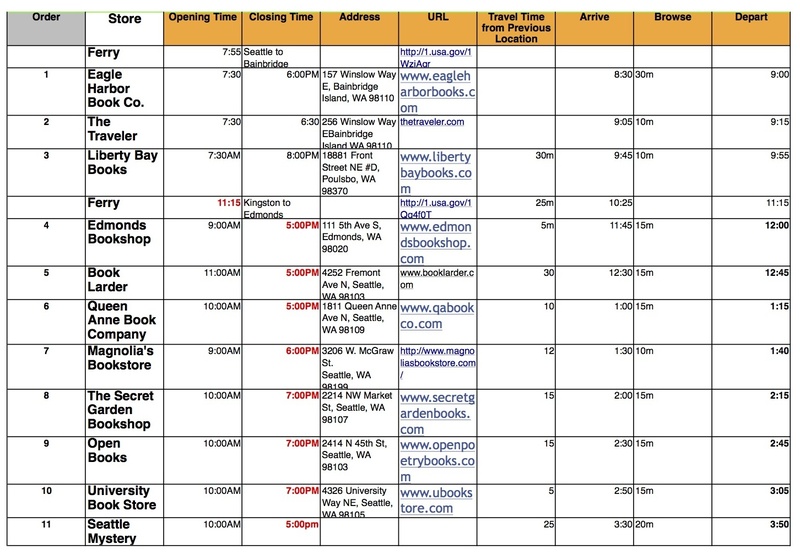 Looking forward to 2018’s #SEABookstoreDay already! And to answer your inevitable question, I picked The Rook to start first. Okay, now I’m not sure we weren’t at Elliott Bay when you got crowned as well! *And* I bought the Pamplemousse mystery (“Monsieur Pamplemousse on Vacation”) at the Mystery Bookshop some hours before you reached it. The book I was unable to find was the Julia Child letter collection; I bought her co-authored biography, “My Life in France,” at Book Larder instead. Oh yay! I did the pay it forward for AKR (#moreforAKR, started by Kirby Larson) and had such fun dropping off $5 at each store (did all 19 as well, but only my second year). Delighted to hear about it reaching a fellow champion! It’s such a wonderful idea, I loved it! 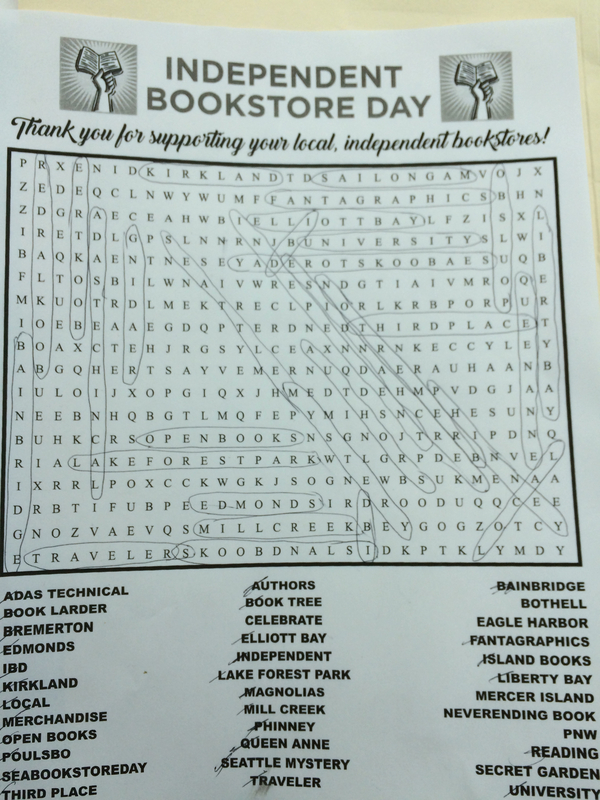 Love the blog, and especially have loved reading your annual Seattle Bookstore Day posts! Maybe next year I’ll have the time and energy to join in the full challenge. Kudos to you and your mom! Thank you, Erin, Catherine, Marianne and everyone who participated. ‘Specially all the lovely folks who came and saw Annie and I at The Neverending Bookshop. A fantastic time was had by all! This is Susan, the woman from the ferry. Just wanted to let you know we had a fabulous day! And by the way, I loved Four Seasons in Rome; good choice!